Alan Nixon with Leonie, outside Chloe's Den at Amble Links. A special caravan which will become a dream holiday home for children with profound disabilities is being officially opened this weekend, after a charity fund-raising drive. The bespoke wheelchair-adapted unit, with wet room, has been named Chloe’s Den and is based at Amble Links holiday park. The respite facility has been purchased by Cramlington-based charity Out of Sight; a parent-led support group for children with visual impairments and multiple disabilities and their families, offering friendship, support, outings and holidays. Out of Sight was inspired to start fund-raising for the holiday hideaway following the death of one of its members, nine-year-old Chloe Gilbert, from Wallsend, in 2014. The mission was launched in October 2015 and with the help of the region’s public and businesses, the £45,000 needed to buy the new bespoke and fully-accessible holiday unit was reached in just over 12 months. Out of Sight will be offering the holiday facility free to all of its members. The opening ceremony will take place this Saturday at 11.30am and guests of honour will be chairman of North Tyneside Council Coun David McGarr, and X Factor finalist Ben Thapa, who is best known as the low tenor in vocal troupe G4. Out of Sight founding member Kath Nixon said: “It’s very emotional to be able to say that Chloe’s Den will be officially opened this weekend, with bookings taken from February. Kath and her husband Alan foster two profoundly disabled children, including Leonie (pictured above). She says that supporting disabled children and their families by offering free respite, in bespoke accommodation for their needs, is priceless. She added: “Many people said they had not had a holiday with their children for years, due to the difficulties of getting the right, accessible accommodation and the rise in prices for that. “Sadly, around the same time, we lost Chloe. At her funeral, her mum Denise talked about her wonderful last memories of being with Out of Sight at the Calvert Trust, doing things with Chloe she could only dream of. “Chloe instantly became the inspiration behind a new idea – a holiday home for Out of Sight members, where we could allow the children and families time to holiday and have some fun, while making memories. She said that Amble Links is an ideal location, because it is near two major hospitals and beaches, among other benefits. 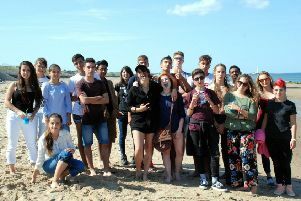 The group has been successful with a bid to the Sunshine Fund to pay for a ramp to access the caravan, while a Hippocampe Wheelchair, which will allow all the disabled children to access the beach during their time at Chloe’s Den, has also been purchased. Surprising donations along the way included two gold sovereigns dropped in to a collecting bucket in Morpeth and the pimped up mobility scooter used by Robbie Williams during the filming of the music video Goin’ Crazy by Dizze Rascal. The scooter will be at the launch event for photo opportunities.